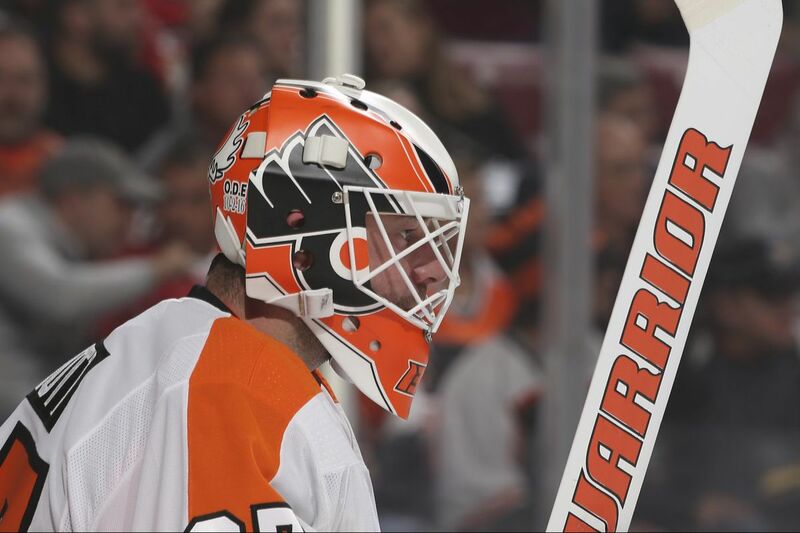 Goaltender Brian Elliott has started in each of the Flyers’ last 13 games. "Physically and skill-wise we are the same team any night," the 32-year-old goaltender was saying as the Flyers prepared for Tuesday night's matchup against the Cup-winning Pittsburgh Penguins at the Wells Fargo Center. "But it's that mental intensity that really changes it. And that comes from the older guys and the leadership group in here that gets us ready to go and makes sure that when the puck drops we are not dipping our toes in but diving headfirst." Of the several factors that have contributed to the Flyers' 16-14-8 record this season, toe-dipping ranks right at the top. The Flyers have emerged from the first period with a lead just once over their last 18 games, requiring gargantuan late recoveries on some nights and resulting in huge regret over missed opportunities on others. Once they recover – when they do recover – they have been consummately better at nailing down victories, a testament to the lessons learned in last season's frequent late collapses and the intangibles Elliott has provided with his play, not just overall but in key spots of the game. After Friday's 5-3 victory in Tampa, the Flyers are 12-0-3 when taking a lead into the third period. The veteran goaltender, who has used the latest injury to Michal Neuvirth as an opportunity to secure the No.1 spot, has started 13 consecutive games, including three back-to-backs. Someone who prides himself on being a hockey player first and goaltender second, Elliott is also not shy in assessing what he has seen playing out in front of him. "I think it's just that awareness of your situation," he said, when asked how the team could reverse the trend of slow starts. "You have to have that drive every game no matter who it is. No matter if it's a Tuesday night or a Saturday night and the crowd is pumped up. Sometimes you have to grind through those games and find a way to win. Those are the little differences that add up." "No question that's an area we can improve in," Flyers coach Dave Hakstol said. "You always put yourself in a position of strength if you can play with a lead instead of chasing after it. We've got four games in a row at home. This would be a good point in the season to improve on that." Ah, but how? It's not as if it's a revelation, or that the root causes are not evident. Injuries, and a lengthy suspension to Radko Gudas, limited the veteran presence on defense and left the penalty kill inept. Whether because of an early concussion that kept him out of the lineup for 10 games or the lingering effects of offseason abdominal surgery, Nolan Patrick (two goals, five assists) has not contributed as expected. Wayne Simmonds, another who might have played at less than 100 percent, is minus-9 this season. Expected to be a big contributor, Travis Konecny has the same number of goals (four) as defenseman Brandon Manning, who has played 15 fewer games. No team in the National Hockey League performs at peak level each night. As Jake Voracek, the Flyers' most consistent producer, said, "Sometimes you don't have it in you. Could be one guy, or only four guys, but just a guy on each line, all of a sudden you're not playing the way you are used to. … You don't have it, legs-wise." By his own admission, Hakstol's almost nightly line-juggling has been an attempt to maintain momentum from one shift to another. After a promising start to the season that suggested improved depth, the Flyers have become too reliant on their top line, and that line has been guilty at times of trying to do too much. A critical mistake by Claude Giroux on the power play in the 3-2 loss to Florida on Thursday — which led to a shorthanded goal — is one such case. He probably wouldn't have taken such a risk if the game had begun differently. "If you're tired and your mind is tired, you make stupid mistakes," said Voracek, who was speaking in general terms. Said Elliott, "You can have one line go out and play great on the first shift, but you have to follow it up and follow it up. At our best, we're rolling all four lines and everybody's getting action. We can cycle the pucks in and get changes. I think that last game against Tampa, you saw changes while the puck was in the offensive zone when we had the puck. That just gets them tired and they ice the puck and it's just a big cycle. That's what helped win those games. "Changing for each other, giving other guys opportunities. Not staying out there too long. Those are the little things that add up to a 60-minute win. It was awesome seeing [Giroux] coming off the ice when we had full control of the zone. He's saying, 'I'm going to give another guy a chance, get some rest, and then I'm going to get back out there.'"